How can I manage computers via the IDrive web interface? Can I add files to the backup set and perform an immediate backup of my connected computer? How do I schedule a backup? How can I restore files/folders from the IDrive web account? 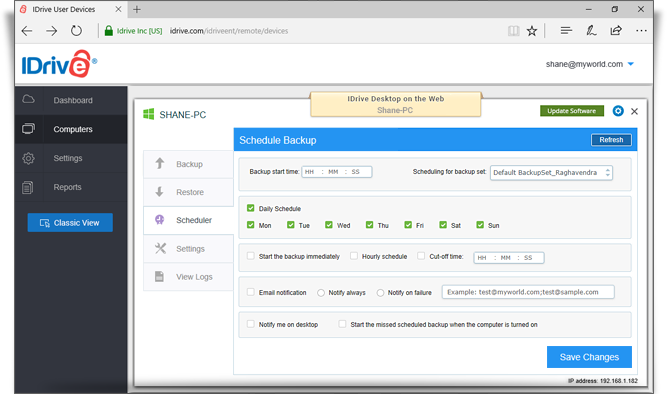 Can I manage my backup settings via IDrive web interface? Can I view logs from my connected computer? If I disable the web access option via the web for a particular computer, can I manage my data backups? Under 'Computers', there are many computers displayed that are offline. Is it possible to remove those entries? IDrive helps you remotely manage all of your connected computers via the web – anytime, anywhere! All your connected computers automatically reflects on your IDrive web interface. To manage these computers, click the 'Dashboard' tab. The 'Computers' tab displays all your computers. Click on any computer name and perform data backups, restore files to the respective computers, configure application settings, view logs and much more on each of your connected computers. You can easily backup files/folders of any connected computers via the web. Login to IDrive and click the 'Dashboard' tab. Click the 'Computers' tab. The list of all connected computers appear here. Click any computer. The 'Backup' screen appears. By default, the 'Backup files to my IDrive account' option is selected. Alternatively, to perform a local backup, select 'Backup files to my Local / Wi-Fi device'. Files already selected for backup appears on the backup set. To add files to the backup set, click 'Change' and select the files to include in the backup set. 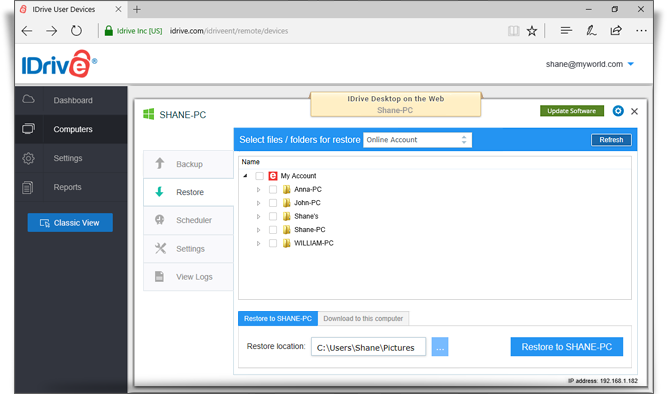 Click 'Start Backup Immediately' to backup your files. You can schedule data backups for each of your connected computers to automate data protection. On the 'Schedule backup' screen, select the backup set, set the day, time and frequency for backup. You can receive email/desktop notifications on completion of backup operations by selecting the 'Email Notification' option. You can restore your files remotely from the IDrive web account to the computer you have used to backup. From the 'Select files/folders for restore' drop-down menu, select 'Online Account/Local Device'. Select the files to restore and choose a 'Restore location'. 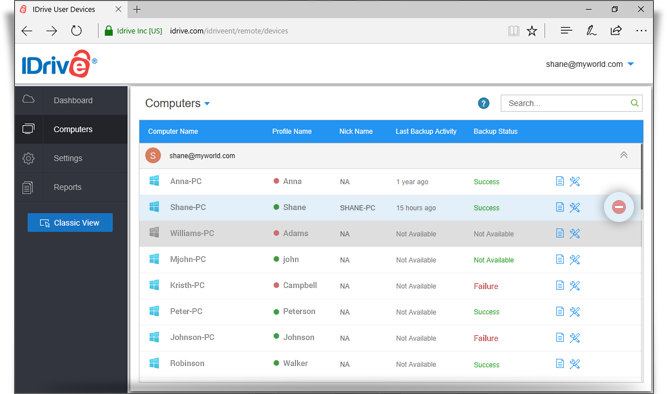 Yes, you can manage your IDrive account settings for your desktop application via the web interface easily. Click on the required computer from the 'Computers' tab. The 'Backup' screen appears. Click the 'Settings' tab displayed in the left navigation bar. Set the following options from the 'Settings' section. Continuous Data Protection: IDrive automatically recognizes the changes made to files present in your backup set and backs them up. To enable, select Continuous Data Protection, and set the frequency of your choice from the drop-down list. Notify for software updates: Select this option to get notified whenever a newer version of the application is available. Notify as 'Failure' if the total files failed for backup is more than % of the total files backed up: You can select this option to receive notifications from IDrive of the same. Ask where to save files/folders before restore: IDrive will prompt you for a restore location on your computer, while restoring your files and folders. Alert me if the scheduled backup fails: IDrive will notify you on the desktop if the scheduled backup fails for 2 days. By default, it is set to 2 days. Automatic power off after the completion of the scheduled jobs: Your computer will be powered off automatically after the completion of the scheduled backup job. Wake up the computer from Hibernate/Sleep mode: IDrive will wake up the computer from Hibernate/Sleep mode and then perform the scheduled backup job. Allow IDrive only for current profile: This option enables you to restrict IDrive to run only under the system profile on which the application has been installed. Backup location on your IDrive account: You can choose the backup location for your IDrive account. Yes, you can view detailed logs via the IDrive web interface. Click 'View Logs'. A list of all the activity logs is displayed. Click the specific log entry you want to view. 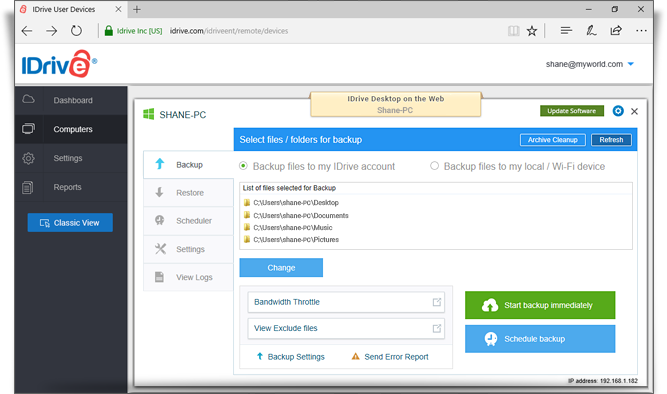 Note: For versions 6.5.0.0 or earlier, 'Desktop Backup Report' summarizes the status of the scheduled backups for your IDrive account. By default, a report for the last seven days is displayed. No. On disabling the web access option, you will not be able to access/manage your backups for that computer, via the web. 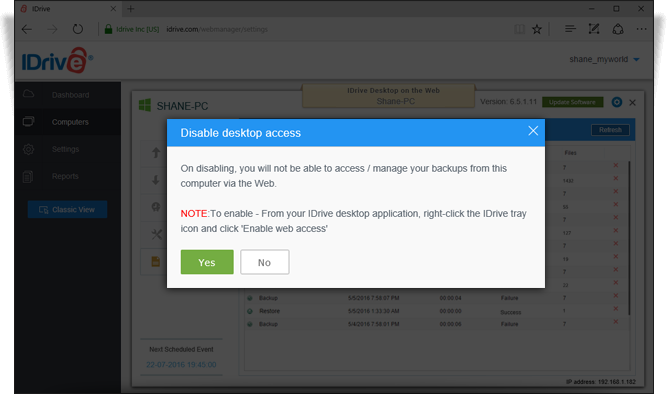 To enable, login to the respective IDrive desktop application, right-click the IDrive tray icon, and click 'Enable Web Access'. Yes, you can remove offline computer entries by clicking .